James Harden scored 24 points, Eric Gordon added 23 and the Houston Rockets outlasted the Los Angeles Clippers for a 101-96 victory on Thursday night in Houston. The Clippers scored six straight points, with four from Austin Rivers, to cut the lead to a basket with less than a minute left. But on the next possession, Harden stepped back and knocked down a long 2-pointer with Rivers in his face to make it 100-96. Rivers missed a 3-pointer after that before Harden made one of two free throws with 6.2 seconds left to secure the victory. 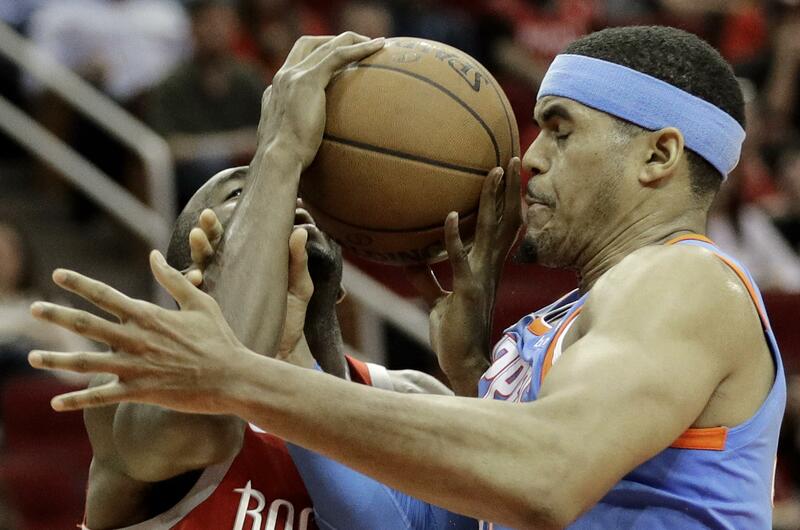 It’s Houston’s third straight win and snaps a three-game winning streak for the Clippers. The victory, coupled with a loss by the Pelicans to the Spurs, wrapped up the Southwest Division title for the Rockets. Tobias Harris led the Clippers with 29 points and Rivers had 20. Trail Blazers 113, Cavaliers 105: CJ McCollum scored 29 points and Portland won its NBA-best 11th straight game with a victory over visiting Cleveland. Damian Lillard added 24 points for the Blazers, on their longest run since also winning 11 in a row in 2013. It was the Blazers’ eighth straight win at home. LeBron James had 35 points, including a highlight-reel dunk in the first quarter that had the fans at the Moda Center momentarily stunned. He also had 14 rebounds for his sixth straight double-double. Kyle Korver added 19 points. Raptors 106, Pacers 99: DeMar DeRozan scored 24 points, Jonas Valanciunas added 16 points and 17 rebounds, and Toronto rallied late to get past Indiana in Indianapolis for its 10th straight victory. The Raptors need one more win to tie the franchise’s longest winning streak. They haven’t lost since Feb. 23 and broke a tie with the 2016-17 squad for longest road winning streak, which is now at eight. But it sure wasn’t easy on a night Darren Collison scored 22 points and Al Jefferson had a season-high 20 for Indiana. Spurs 98, Pelicans 93: LaMarcus Aldridge scored 25 points, Dejounte Murray had 18 points and 12 rebounds, and San Antonio overcame another late rally to beat New Orleans. New Orleans was playing hours after learning Pelicans owner Tom Benson had died. Benson was hospitalized with the flu on Feb. 16 and never recovered. The 90-year-old native of San Antonio owned both the Pelicans and the Saints. Anthony Davis finished with 21 points and 14 rebounds, but fouled out after playing 36 minutes. New Orleans fell to sixth in the West. 76ers 118, Knicks 110: Joel Embiid had 29 points and 10 rebounds, Ben Simmons finished with a triple-double, and Philadelphia used a big final period to rally past the Knicks in New York. Nuggets 120, Pistons 113: Nikola Jokic had 23 points, 12 rebounds and 10 assists for his eighth triple-double of the season, Jamal Murray added 26 points and Denver’s playoff hopes received a much-needed boost with a victory over the Pistons in Detroit. Will Barton hit a big basket down the stretch and later knocked down two free throws to help the Nuggets hold off a Pistons team that trailed by as many as 26 points in the third quarter. The Nuggets now hit the road for a pivotal seven-game trip. The fading Pistons dropped their 11th straight road game despite Andre Drummond scoring 21 points and grabbing 17 rebounds. Blake Griffin added 26 points and nine assists. Jokic’s eight triple-doubles are the most by a Nuggets player in a season since Fat Lever had nine in 1988-89. Jazz 116, Suns 88: Donovan Mitchell scored 23 points and Rudy Gobert had 21 points and 13 rebounds to lead Utah over Phoenix, its eighth consecutive victory. T.J. Warren paced Phoenix with 19 points while Josh Jackson had 17 and Devin Booker had 12. The Suns have lost seven in a row. Ricky Rubio had 12 points and 11 assists, and Dante Exum made his first appearance of the season for the Jazz and finished with 10 points. Hornets 129, Hawks 117: Dwight Howard scored 20 of his season-high 33 points in the second half, Nicolas Batum had a triple-double and set a career high with 16 assists, and Charlotte beat the Hawks in Atlanta. Kemba Walker added 24 points and Marvin Williams had 17 for Charlotte, which kept its slim playoff hopes alive. The Hornets began the night having lost six of seven and were in 10th place in the Eastern Conference, 6 1/2 games behind No. 8 Miami with 13 games remaining. Taurean Prince finished with 22 points and rookie John Collins tied a career high with 21 for Atlanta, the worst team in the East at 20-49. Bulls 111, Grizzlies 110: Antonio Blakeney made two of three free throws with 1.8 seconds left as visiting Chicago handed Memphis its 19th straight loss. On the game’s final play, Memphis got the ball to Marc Gasol for a baseline fadeaway that was long. JaMychal Green tipped it in but after the horn, although it appeared to be basket interference anyway. Zach LaVine led the Bulls with 20 points while playing only three quarters, while Bobby Portis scored 17. Denzel Valentine had 15 points, going 5 of 7 from outside the arc. Tyreke Evans had 25 points and nine assists for Memphis, while Gasol added 21 points and 10 rebounds. Jarell Martin scored 15 points and Green finished with 15 points and 10 rebounds.